Here are we with an important update for the candidates who have passed FMGE June 2018 examination. 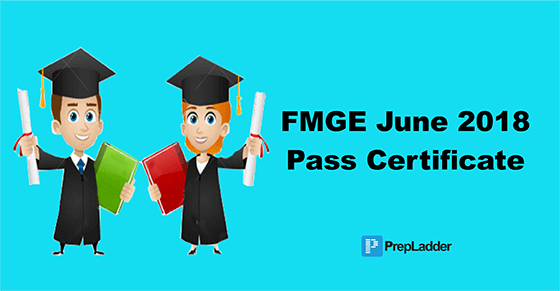 The date-wise schedule for issue of pass certificate & the documents required for getting pass certificate after qualifying FMGE has been released. The FMGE exam was conducted by National Board of Examinations on 29 June 2018. The results of FMGE exam had been declared on 27 July 2018. Haven’t checked your FMGE June 2018 results yet? Click here to check it now. Pass certificate to the eligible candidate shall be issued to them IN-PERSON only. National Board of Examination, PSP Area, Sector-9, Dwarka Office, New Delhi- 110075 from 17 August – 23 August 2018. Biometric verification will take place again & the fingerprint of all the pass candidates will be captured. Candidates are requested to co-operate with the process. Pass certificate shall be issued only after the successful verification of the identity of the candidate. The candidates who have passed MBBS from Nepal are given a liberty for not carrying their original passports with them. All other candidates should compulsorily carry their original passport with them failing which pass certificate shall not be issued to them. You can also go through the Official Notification on Official Website.